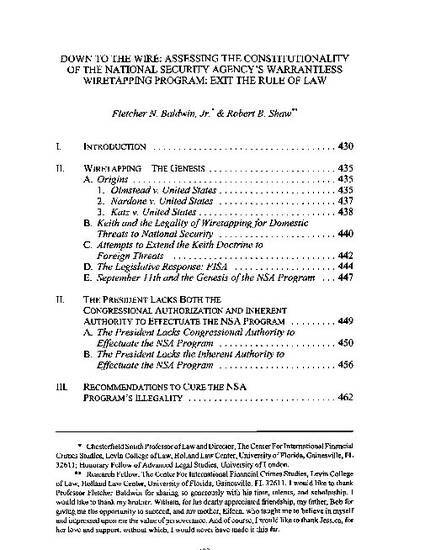 "Down to the Wire: Assessing the Constitutionality of the National Security Agency's Warrantless Wiretapping Program: Exit the Rule of Law" by Fletcher N. Baldwin, Jr. The article discusses the constitutionality of warrantless wiretapping surveillance by the National Security Agency (NSA) on U.S. citizens. The wiretapping program existed weeks after the September 11, 2001 attacks, on the justification that Congress authorized the president to wiretap U.S. citizens without a warrant, and that the president had inherent authority as commander-in-chief. But it is argued that Congress did not expressly authorize the president to conduct warrantless wiretapping and that he does not have such inherent authority. We intend this Article to be a commentary on the constitutionality of the NSA wiretapping program solely as it relates to the warrantless surveillance of U.S. citizens. We will focus upon the legal history as established through case law. We will then attempt to rebut the Administration's arguments in defense of the program, and within this context we will argue that the program cannot withstand legitimate constitutional scrutiny. The facts and law simply do not support the so-called NSA program that authorizes the surveillance.